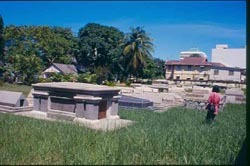 In 1895, the first Jew, Ezekiel Menassah emigrated from Baghdad and settled in Penang, Malaysia. For more than 30 years, Menassah remained the only Jew in to the country, continuing to observe Jewish holidays and keep kashrut. Following World War I, more Jews began to settle in Malaysia. Then during World War II, the Jewish community was evacuated to Singapore. 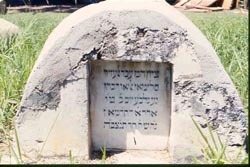 By 1963, only 20 Jewish families remained in Malaysia. Today, approximately 100 Jews reside in Malaysia. 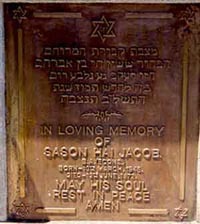 On the island of Penang there is a tiny congregation and a cemetery in George Town in Jewish Street (Jalan Yahudi). 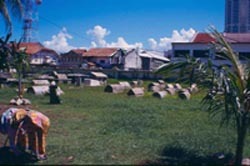 The Jewish cemetery in Penang is considered to be the oldest single cemetery in the country. 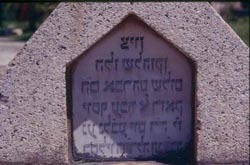 The oldest legible gravestone in the cemetery dates to 1805 and the latest to 1976. 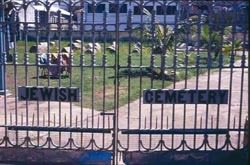 The cemetery also includes the grave of a Jewish British officer killed during World War II. Most of the Jews living in Malaysia are refugees from Russia. Israeli economic relations with Malaysia have been expanding, with total trade between the countries reaching $1.529 billion in 2013, doubling the amount of trade that occured in 2012. Most of this number is accounted for by Israeli exports, notably Intel computer parts that are made in Kiryat Gat in Israel and then are sent to a secondary assembly plant in Malaysia. Despite this economic cooperation representing a significant amount of business on both ends, Malaysia is relatively silent about their relations with Israel. Even with over $1.5 billion in trade between the two countries, Israel is still listed ambiguosly under the other countries heading in Malaysia’s published foreign trade statistics. Since 2009, Israel has seen a dramatic increase in the number and percentage of tourists visiting from Arab countries, signaling a warming of relations between Israel and the moderate Arab world. More than 250,000 individuals have come to visit Israel since 2009 from Arab and majority Muslim countries, including 23,483 individuals from Malaysia. Mahathir Mohamad, elected Malaysian Prime Minister in 2012, is an avowed anti-Semite who has written on his personal blog that he believes Jews rule this world by proxy. Speaking at the Organization of the Islamic Conference summit in Kuala Lumpur in 2003, Mohamad stated I am glad to be labeled antisemitic […] How can I be otherwise, when the Jews who so often talk of the horrors they suffered during the Holocaust show the same Nazi cruelty. In his book The Makay Dilemma, published in 1970, Mohamad charges that the Jews are not merely hook-nosed, but understand money instinctively. In November 2018, Mohammad criticized the Australian government’s decision to recognize west Jerusalem as the capital of Israel: “Jerusalem has always been Palestinian territory and it must remain in its current status,” he said. Israel does not have official diplomatic relations with Malaysia and does not have a representative office within the country. Anti-Israel sentiment is deeply ingrained in the power structure of the country, as demonstrated by Malaysian passports that when opened are imprinted with the statement This passport is valid for all countries except Israel. Herb Keinon and Reuters, “Malaysia Stripped Of Paralympic Swimming Championships After Israelis Ban,” Jerusalem Post, (January 27, 2019).